Pathways to Well-Being in Design attempts to illuminate how different disciplines approach the shared goal of supporting human well-being. The book’s chapters are drawn from many fields and represent the various initiatives that support well-being within these fields, each located within its own disciplinary/practitioner framework. The chapters consider initiatives that support well-being among different groups (children in Chapter 1 and the elderly in Chapters 2 and 10), in different places (community gardens in Chapter 4 and workspaces in Chapter 9), in different kinds of spaces (material space in Chapter 5 and virtual space in Chapter 7), and across different times (the life course in Chapter 3 and the future in Chapter 8). Chapter 1 investigates the extent to which the New Economics Foundation’s Five Ways to Well-Being framework could be applied to children’s well-being. Through a mixed methodology approach, the researchers explore children’s perspectives on activities that enhance their well-being. Chapter 2 and Chapter 10 deal with the well-being of the elderly and vulnerable: those requiring assisted living technologies and those with late-stage dementia, respectively. These chapters recognize that increased age is “correlated with increased likelihood of disability, long-term health conditions and poorer well-being” (page 34). Finding innovative and effective ways to support the well-being of the elderly is therefore of the utmost importance in societies with ageing populations. In our increasingly urbanized world, it is also important that we address the well-being of modern city dwellers. 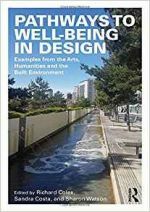 Chapter 5 provides a framework for understanding and applying the concept of Biophilic Design, arguing that it offers an “ecological and ethical response to the stressful impacts of city life, addressing the breach of modern society from the natural world” (page 97). Based on research that exposure to nature has mental and physical benefits to human health, Biophilic Design is a process that incorporates nature into the modern built environment. In addition to the physical world, the non-physical and virtual world impacts well-being. In Chapter 7, John Sparrow explores the influence of online activities on emotions as a component of well-being. The chapter begins by considering evidence that the extent and form of internet usage are correlated with depression. It proceeds to investigate the impact of e-coaching on well-being as part of a larger research agenda on how the design of internet encounters can enhance well-being. The book concludes with a discussion on the outcomes of its chapters, offering insights and reflections on the various themes that have arisen. These themes include the work of the Children’s Society, designing for well-being, developing empathy, therapeutic interaction with nature, greenspace as infrastructure in the built environment, biophilia, emotional transition, restoration in the workplace, well-being dimensions and dementia, chilling out, and the future in which well-being is embedded as a common goal.